A note of encouragement to women who are struggling with how to fit a concealed handgun into their daily wardrobe. For several days last winter, my photographer and dear friend Bob and I spent a lot of time together photographing a series of illustrations showing the success or failure of various combinations of handgun size, holster type and covering garments for concealed carry. We were continually surprised at the number of times we put together the “Don’t do” illustration only to have Bob ask, “What, exactly, am I supposed to show?” Combinations we were sure could never be worn out in public for fear of revealing a concealed gun were apparently much better at concealment than we thought. It reminded me of a conversation I’d had with Tom Givens of Rangemaster in Memphis, TN, in which he emphasized that when armed citizens select micro-sized handguns for self defense, they focus too much on ease of carry, not on the firearm’s functionality under the duress of a fight to save human life. That’s a mistake, he stressed. We carry guns for defense under terribly stressful circumstances. That means we need to choose guns that are large enough to fire accurately, rapidly and repeatedly, if that becomes necessary. We are overly-focused on our own uneasiness. We fear being discovered carrying a concealed handgun. Thus we exaggerate how much the gun shows through our clothing, or assume it shows, when indeed it does not. “The public is not focused on you,” Tom emphasized. 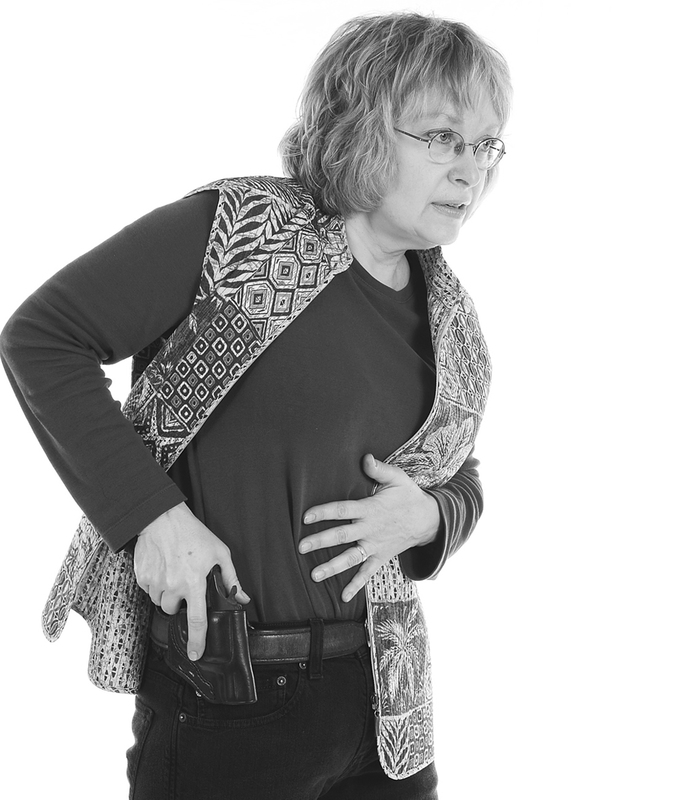 “In fact, most people probably don’t even see you standing there!” We shared a good laugh, and I learned an important lesson, while we were illustrating my new book Concealed Carry for Women. Of course, we must take reasonable steps to be sure guns concealed for personal defense remain concealed. But we also need to realize that unless you’re wearing very tight or abbreviated garments, most compact sized firearms are surprisingly concealable. ❰Can I Shoot Lead in My Glock? Since 1993, Gila Hayes has been a staff instructor for the Firearms Academy of Seattle, teaching gun safety and armed self defense. Hayes is one of three founding leaders of the Armed Citizens’ Legal Defense Network, Inc., and produces a monthly journal published online at www.armedcitizensnetwork.org. She is the author of Personal Defense for Women and Concealed Carry for Women.